Another day, another market report on the size of the mobile game market. This time it was App Annie’s turn to fire up investors and CFOs with its predictions for massive market growth. The headline figure on the App Annie Market Forecast 2016 to 2021 was that by 2021, App Annie expected gross consumer spending across all app stores would “surpass $139 billion”. Obviously, as a prediction it’s not something that can be dis/proved, at least until 2020 or 2021. Similarly, we can’t fault the claim gross consumer spending on games via all mobile app stores “should exceed $105 billion”. But, when considering predictions about the size of the mobile game sector from market intelligent companies, it’s clear there’s plenty of divergence. This is even the case if we want to know how big the global mobile game market via app stores was in 2016. In its report, App Annie states a figure of $50.4 billion. However, in January 2017, Superdata and Unity’s 2016 Mobile and VR Games Year in Review provided a total of $40.6 billion. That’s a difference of almost $10 billion, or 20%. 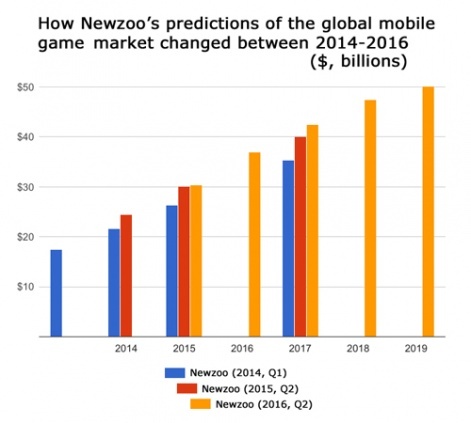 Unfortunately, I couldn’t find an up-to-date figure from the other big market intelligence outfit Newzoo, but in April 2016, it predicted the 2016 global game market would be worth $36.9 billion. Like a peacock, the bigger the numbers, the more attractive the insight. Note, all these companies are secure enough in their numbers they’re happy to claim accuracy to -/+$50 million. 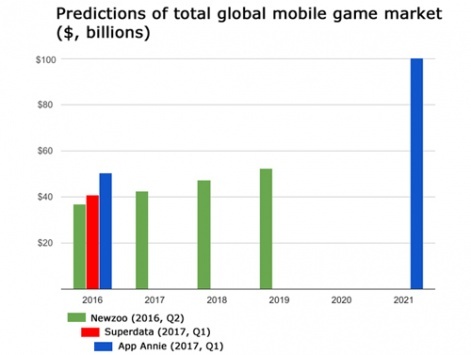 In this context, it’s interesting to take a deeper look at Newzoo’s historic predictions about mobile games, not because it’s any better or worse than the others, but because there’s more data available. Back in early 2014, it reckoned the mobile games market in 2014 would be worth $21.7 billion, a total it uprated to $24.5 billion in April 2015. Similarly, its 2014 prediction for 2015’s total was uprated from $26.3 billion at the start of that year to $30.1 billion in April 2015 and then further tweaked to $30.4 billion in April 2016. Over two years, its 2017 predicted total has risen from $35.4 billion to $42.5 billion. All these companies will use different assumptions in coming up with their figures. But the main reason for the spread between predictions and their one-upmanism nature is the commercial imperative of such reports is to promote the services of the companies concerned. The assumption is clients prepared to spend big money on deeper analysis want to hear there’s plenty of growth potential in a sector. More interesting would be revisiting previous predictions and explaining why they proved wrong. 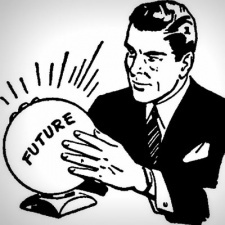 That’s why predictions can include the widest range of possible market activity to boost the headline number. Not related to mobile games, but estimates of the overall games market sometimes include hardware sales, for example. Yet, this sort of padding can have consequences, especially in nascent markets such as VR and eSports, when the year in which they will hit a symbolically large market value - $1 billion say - gets pushed back and back, while the enormous peak-market total mysteriously remains the same. No-one really cares how big the mobile game market is because we all know it’s enormous and we all know how the value chain works. But that’s not the case in terms of the value of the VR software market, and certainly not for something as complex as eSports’ value chain. Of course, at heart, everyone understands predictions - especially predictions about a situation five years hence - are bound to be wrong. What’s interesting about making - and reading about - them is the assumptions that underpin them. App Annie has attempted to show something of this in its report. It breaks out growth in the key markets - China, US, Japan, South Korea etc - also looking at how the balance between the Apple App Store, Google Play and third-party Android stores will shift. But there’s no real attempt to explain how these segments feed into the totals in such a way that anyone could understand how future increasing or decreasing growth in China, say, will impact them. Equally, it could be argued that focusing on underlying structural changes means predictions are often blindsided by new products. For example, while Clash Royale generated $1 billion of mobile game market value in 2016, it more likely displaced revenue from other games than generating new value. Pokemon Go generated $1 billion in mainly new value, however. The former is easy to predict, the latter is hard. In keeping with best practice (as championed by Nate Silver), perhaps it would have been more insightful if App Annie (and other companies) put some probability boundaries on their numbers. 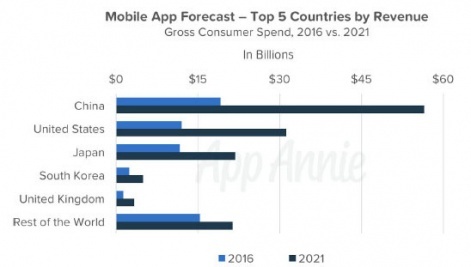 As with weather forecasters telling us there’s a 30% chance of rain, App Annie could have said "We think there’s an 80% chance total consumer app store spending will be $139 billion by 2021". At present, the wording in its report that “App Annie expects…” could be viewed as suggesting an occurrence probability of anything from 51% to 100%. Even more interesting would be a section revisiting previous predictions and explaining what trends resulted in them being over or under-estimates. Because, at the end of the day, everyone knows these numbers will be wrong. That’s why App Annie, Newzoo and Superdata etc shouldn’t compete or be judged on the accuracy of their predictions, but the reasons why.